The Wheeling Nailers, the ECHL affiliate of the Pittsburgh Penguins, announced during a press conference Wednesday morning that Mark Dennehy has been selected as the new Head Coach. He is the 17th Head Coach in the teams history. The change comes off the heels of a disappointing regular season in which the team failed to qualify for the Kelly Cup Playoffs just a year after playing in the Finals, as well as mounting disapproval from both the organization and the fan base in now former head coach, Jeff Christian. Dennehy, a native of Worchester, Mass., was a defenseman at Boston College, playing along side current Pittsburgh Penguins Assistant General Manager and General Manager of the Wilkes Barre/ Scranton Penguins, Billy Guerin. Guerin spoke highly of the newly appointed head coach, citing that the position was of extreme popular interest. "No less than 50 resume's," Guerin remarked twice as a way of assuring those those in attendance and watching online via a live Facebook stream that the decision was not made out of haste or solely on familiarity. After his playing days at BC, Dennehy went on to become an Assistant at Princeton and the University of Massachusetts-Amherst before taking the Head Coaching position at Merrimack College in 2005. After a sluggish start, Dennehy would turn the team around, making it to the Hockey East Tournament Final and an appearance in NCAA tournament in 2011. "When Mark took over at Merrimack College, the school had just gone through 16 straight losing seasons. Within a matter of six years, he had the team setting school records," remarked Don Rigby, Governor of the Nailers Organization. Dennehy also received the 2010 Bob Kullen Coach of the Year award, the first Merrimack head Coach to ever receive the award. 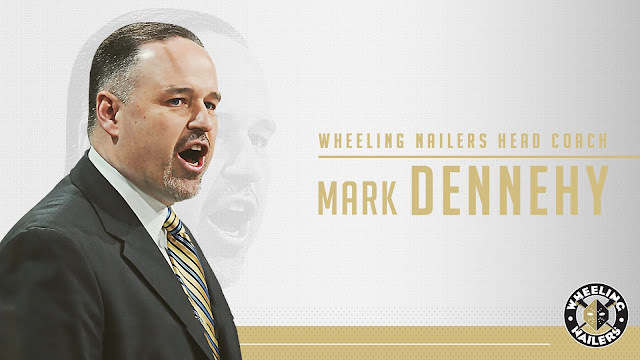 When given the opportunity to address the crowd and media, Dennehy spoke of how highly regarded the Nailers team had become and commented on the various players he once coached in college who had gone on to play in Wheeling. Dennehy also commented on his ability and need to develop players with the focus on being ready for the NHL. "A big part of development is winning," Dennehy said. "and one thing I will make sure of is that we bring I quality players, who are part of the community," he continued. How the Wheeling community will take to the new coach is anyone's guess. A majority of the Wheeling fanbase soured on former head coach Christian for his unwavering refusal to give into the hard nosed, brawler style of hockey many of them came to know and love (among various other issues within the club). With Dennehy making it a point to comment on his approach to player development for NHL readiness, it will be interesting to see just how the fan base takes to him. Will they give him a chance to show what he can do, or will the stubborn mindset of what hockey, "should be" be too much of a shadow to step outside of? The Nailers begin their 2018-19 season on the road versus the Norfolk Admirals on Oct. 13. Their home opener is November 3, versus the Indy Fuel.